Online analysis of athletes’ tactical, technical, and physical capability is playing an increasingly important role in modern sport training. The underlying idea – known as the Hawthorne effect – is simple: if you can measure your performance, you can also improve it. Following this principle, two research assistants from Technische Universität München (Germany) founded the company Kinexon GmbH at the ESA Business Incubation Centre Bavaria and developed a cloud-based solution for analysing and visualising training data on mobile devices. The solution kits athletes out with a small, portable location sensor and feeds the resulting data into the cloud by means of a stationary base antenna. This enables users to track and analyse performance parameters and tactical movements down to the centimetre – all in real time. In particular, however, it was the solution’s user-friendliness during training and relatively low cost (compared to the camera-based systems commonly seen today) that won over the international jury of experts in the European Satellite Navigation Competition (ESNC). 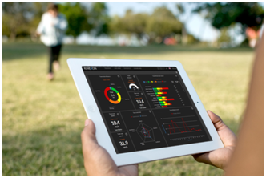 So far, the high price of such systems has limited their use to professional sport; Kinexon’s system will now give amateur clubs the chance to benefit from adding online analysis to their training activities, as well. Along with the sport sector, this flexible satellite-based localisation system also exhibits huge potential in tapping into further markets, including healthcare, logistics, and unmanned aerial vehicles (UAVs). “We’re pleased to be supporting Kinexon at ESA BIC Bavaria,” affirms Thorsten Rudolph, CEO of Anwendungszentrum GmbH Oberpfaffenhofen. The Kinexon system, the first version of which is set for market launch in November 2013, managed to edge out more than 400 other ESNC entries from nearly 50 countries.